The 2011 Volvo C70 comes with many standard features that are optional on its competitors, so while the price is definitely at entry-luxury levels, you won't find yourself adding tens of thousands of dollars in additional equipment. Attractively restyled this year, the 2011 Volvo C70—a coupe that becomes a convertible—offers a strong overall package with a clean, pleasant interior. The 2011 Volvo C70 benefits from fresh new front-end styling, giving it a sportier appearance. 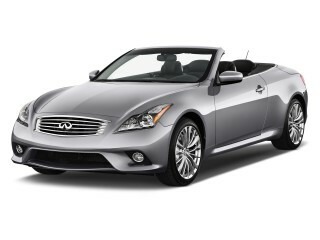 With the top up, it's a two-door coupe. Then, 30 seconds later, when the retractable hardtop has folded into the trunk, the peppy turbocharged five-cylinder engine makes it a fast and fun top-down tourer. Its limited cargo space with the top down, however--and the challenge of planning to put luggage in the trunk before the top goes down--combine with the small rear seats to suit the C70 better to a pair of adults than a family of four. The crisper exterior styling combines well with its interior design, which provides the look you expect in a luxury convertible, with a bit of a Scandinavian twist. The floating console design is distinctive, and the entire package comes off like an audiophile's speaker cabinet, with aluminum trim giving a clean and modern look to the C70's living quarters. 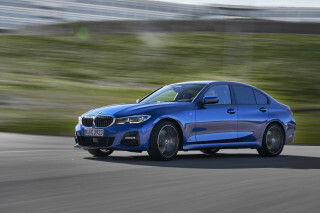 The 227-horsepower turbocharged 2.5-liter engine powers the front wheels through a five-speed automatic transmission that's the only gearbox available this year (a six-speed manual offered in previous years has been dropped). 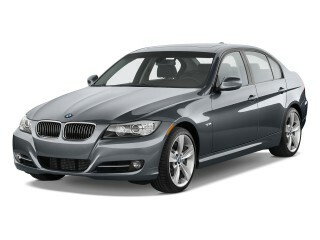 It offers smooth shifts and pairs well with the punchy performance of the little turbocharged engine. Top speed is rated by Volvo at 150 mph, with acceleration from 0 to 60 mph pegged at 7.5 seconds. Fuel economy ratings have improved this year, though they're hardly top of the pack, with EPA gas-mileage ratings of 19 mpg city, 28 mpg highway, for an overall average of 23 mpg. Despite its grand-tourer heft of 3,840 pounds (retractable hardtop systems are heavy), you can hustle the Volvo C70 comfortably through the corners. The steering is tight, and the whine of the turbo engine inspires sporty driving. Volvo gets high marks for making the electric power steering feel linear and not too numb. MacPherson struts at the front and a multi-link rear suspension keep the car firmly planted on the road. If you're driving over rough and irregular surfaces, however, you'll feel the front and rear sections of the car shake separately--it's far from the most rigid convertible we've driven. 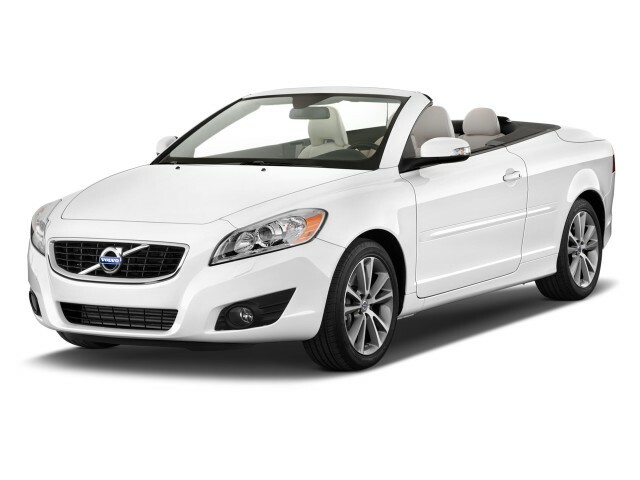 The base price of 2011 Volvo C70 is $39,950, though it's likely to be closer to $45,000 once you've added a few options. The restyled 2011 Volvo C70 gets a little more aggression with its clean, conservative design. It’s attractive and appealing with the top up or down. The 2011 Volvo C70 benefits greatly from redesigned front fenders, headlights, and new LED taillights, which give it a crisper frontal appearance and bring the formerly bland coupe into sharper focus. It looks equally good with the folding top up or down, and the interior delivers an appropriate refined and luxury appearance with Scandinavian design accents setting off the redesigned instrument panel. Most reviewers found the car appealing to look at, and the C70 is certainly many steps away from the legendary boxy Volvos of yore. Putting the retractable hardtop down (or up) provides its own sideshow, with onlookers pausing to watch as the roof separates itself into three pieces that nest together before dropping neatly below the rear-hinged rear deck lid. Inside, Volvo's characteristic floating console design complements the aluminum trim and a generally contemporary look with aluminum trim. The console's sculpted wooden face is particularly noticeable, and Volvo's restrained use of wood--real wood, in a lighter tone than the usual dark, heavy, shiny stuff found in German sedans--gets high marks. The 2011 Volvo C70 is more of a boulevard cruiser than a sportscar, though luxury-minded buyers will appreciate its balance of ride and handling. Under the hood of the 2011 Volvo C70, a 2.5-liter, turbocharged, five-cylinder 227-horsepower engine delivers power to the front wheels through a five-speed automatic transmission. While the performance is satisfying, it's hardly thrilling. There's enough low-end torque to move away briskly from a stop, with acceleration from 0 to 60 mph of roughly 8 seconds, and a top speed of 150 mph. And the transmission shifts smoothly, taking advantage of the turbo's punchy power at higher revs. The handling of the C70 gets mixed reviews. Many drivers felt it was suitably light and sporty, especially considering the considerable heft of the car. And the electric power steering, a technology that used to mean numb, feedback-free steering feel, gets good marks for linear and realistic road feel. The ride is well controlled, thanks to the MacPherson struts up front and a sophisticated multi-link rear suspension design. Still, the C70 is a better grand touring car than it is a sports car. On winding roads, a suspension optimized for ride quality can cause the car to wallow. In most cases, though, body lean through turns is modest and the front-wheel-drive coupe behaves with predictable understeer. The 2011 Volvo C70’s interior build and material quality is good, and it’s a comfortable traveling car, though it has its share of Swedish design quirks. The 2011 Volvo C70's fit and finish are impressive. For 2011, full leather upholstery is standard, adding luxury to comfortable, supportive front seats that hold occupants firmly in place without squeezing or poking. Overall, the interior materials both look and feel good. It's a different story in the rear, where the cramped seats are compromised by the space required to house the folding-top mechanism. Full-sized adults won't tolerate sitting back there on anything more than a short trip, mostly due to the minimal leg room. And getting back there with the roof erected is its own challenge, requiring contortionist moves. In truth, the C70 is a very comfortable touring car for two that also happens to have occasional seats in the rear. The rear seat is more likely to be used for goods or gear than for human occupancy. A pass-through between the two rear seating positions allows skis to be carried inside the car, another little Scandinavian touch found on few of the C70's competitors. When the top is up, the trunk offers a substantial 12.8 cubic feet of storage room. Fold the top down, however, and that falls by more than half. You can still stow two bags of golf clubs--just--but getting oddly shaped items into the hutch that protects luggage from the folded roof that sits on top may require you to put the roof up, stow your gear, and then put the roof down again. The top mechanism works beautifully, requiring only a foot on the brake and the touch of a button, but when folded, the storage space that remains just isn't competitive with others in the class. The rest of the interior storage isn't lavish, either, with small front door pockets and a dearth of the bins, cubbies, cupholders, and mobile-phone positions that the best modern interiors now offer. There's a bin behind the "floating" center stack panel, but while it offers a decent amount of room, it's remarkably awkward to get to. While Volvo's trademark climate controls are almost idiot-proof, other functions don't deserve the plaudits. Volvo has had a hard time with modern electronics, with navigation systems that don't come close to the best in the business. A mixture of regional accents in the navigation system voices was just strange, while figuring out how to input addresses and use other navigation functions was far from intuitive. And the same applies to stereo and Bluetooth controls. On the move, however, these quibbles fade away. With the top up, the C70 is a quiet, cozy coupe; folding down the top turns it into a wide-open tourer that admits all the sunshine any convertible lover could want. 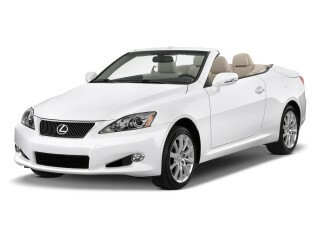 There's very little wind buffeting with the top down, and while tire noise is always present, it's not oppressive. It may have a folding top and open-air design, but the 2011 Volvo C70 maintains the brand’s traditional no-compromise approach to safety. The 2011 Volvo C70 upholds the brand's stellar reputation for safety, being one of very few convertible models to fit side-curtain airbags. Rather than dropping from a roof rail--which may have been folded into the trunk if the weather is nice--they inflate upwards from the top of the inside door panel. The C70 has six airbags, all told, along with stability control, traction control, anti-lock brakes, and a tire-pressure monitoring system. The Insurance Institute for Highway Safety (IIHS) rates the 2011 Volvo C70 as "Good" on both its frontal-offset and side-impact crash tests, and also its rear crash-protection and head-restraint assessment. 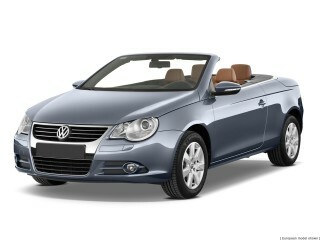 Front headrests that reduce whiplash are fitted as standard. The IIHS did not rate the car for roof strength, however. The C70 has also not been rated by the National Highway Traffic Safety Administration (NHTSA). An additional safety feature is a pair of pop-up bars that can punch through the rear window if the car has landed upside-down after an accident. Volvo's tallights also illuminate more brightly under the heaviest braking, including when the anti-lock brakes activate. Volvo also pioneered a blind-spot information system, which illuminates a small warning light in each door-side mirror when a vehicle is in the driver's blind spot on each side. While a few reviewers found the system annoying, most said it was useful--though unnecessary when the blind spots had vanished because the top was folded into the trunk. Most reviewers praised the simple and appealing set of standard and optional features offered in the 2011 Volvo C70. Volvo has streamlined and simplified the offerings on the 2011 C70 convertible coupe, with only a single powertrain and more features fitted as standard. The 2011 Volvo C70 has a base price of $39,950, which now includes leather seats and Sirius satellite radio, among other . Standard features include dual-position adjustable front headrests, newly styled 17-inch diamond-cut alloy wheels, and integrated fog lights. Four separate options packages make up the majority of the upgrades, along with a handful of standalone options. The Dynamic option package bundles dual xenon headlights that swivel to light the road around curves with two appearance options: 18-inch diamond-cut alloy wheels and a three-spoke leather-wrapped steering wheel with aluminum inlay. The complete package is $1,000. The most expensive options group, the Multimedia package at $2,600, includes both an in-dash navigation system with real-time traffic information and a Dynaudio premium sound system with Dolby ProLogic II Surround Sound and 12 speakers, including a pair of active subwoofers, each with its own 130-watt amplifier. Alternately, a portable navigation system is a standalone option for $750. The Convenience package, for $1,000, is made up of keyless entry, rear parking assist, an auto-dimming rear-view mirror with an integrated compass, and an integrated garage-door opener. Finally, the $900 Climate package includes heated front seats, headlight washers, rain and humidity sensors, and interior air-quality filtering. The gas mileage of the 2011 Volvo C70 isn’t particularly noteworthy, but it’s hardly likely to be a first consideration for potential buyers. The 2011 Volvo C70 is fitted only with a five-speed automatic transmission paired to its 2.5-liter five-cylinder engine. A six-speed manual gearbox offered in previous model years is no longer available (although, confusingly, the EPA still has mileage ratings for that combination on its website). The EPA rates the 2011 C70 at 19 mpg city, 28 mpg highway, for a combined rating of 23 mpg. That's something of an improvement over its mileage numbers in earlier model years, but it's still pretty low for what’s essentially a two-seat car with occasional seats in the back. Any number of four-door compact sedans offer far higher mileage ratings. But no one who’s considering a coupe with a retractable hardtop for open-air motoring is likely to be cross-shopping the Volvo C70 against, say, a 2011 Hyundai Elantra, with its 40-mpg highway rating. For buyers deciding whether to treat themselves to the C70 convertible coupe, gas mileage is likely to be one of the least important factors. Looking for a different year of the Volvo C70?